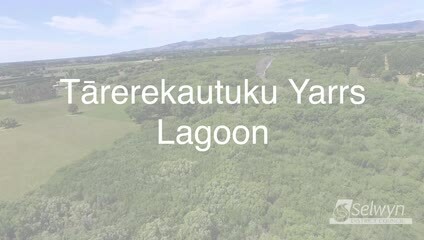 Tārerekautuku Yarrs Lagoon - how do you want it managed and protected? Tārerekautuku Yarrs Lagoon is one of the largest freshwater wetland habitats remaining in the low plains of the Selwyn district. The lagoon is located near the Lincoln township in the Ararira/LII River sub-catchment of Te Waihora/Lake Ellesmere. Yarrs Lagoon has important hydrological and ecological functions within the catchment, with numerous waterways and springs present. The reserve supports native swamp, forest and scrub vegetation that are now rare on the plains. The 76.89ha reserve is administered by the Selwyn District Council and is subject to the Reserves Act as a Local Purpose Reserve. The wetland was originally reserved in 1905 as a sanctuary for native and imported game species, but the wildlife sanctuary status was later revoked in 1957. Over time, the wetland area has been reduced. Now the channelised Ararira/L II River, and a network of inflowing drains bisect the reserve. More information on Yarrs Lagoon and the intention of the draft Reserve Management Plan can be found here. Council and members of the Tārerekautuku Yarrs Lagoon Care Group are now preparing a (Draft) Reserve Management Plan for the lagoon, based on feedback from the community. The Council plans to ask for public feedback on the draft management plan in February/March 2019. Watch this page and the Council's Facebook page for updates. For more information, email: reserves@selwyn.govt.nz. Thank you for taking the time to fill out this form. Your ideas on how to manage and protect Tārerekautuku Yarrs Lagoon will help inform the writing of the Reserve Management Plan. Notification of intention to develop a Reserve Management Plan for Tārerekautuku Yarrs Lagoon. Preparing a draft Reserve Management Plan (expected to be completed late 2018). Call for feedback on draft Reserve Management Plan. The Council plans to ask for public feedback on the draft Management Plan in February/March 2019. A public hearing will be held in early 2019 if people wish to speak to their submissions on the draft Management Plan. The Council will review the draft Management Plan and all submmisions. The Council will approve the Tārerekautuku Yarrs Lagoon Reserve Management Plan in 2019.